In South Florida, the rainstorms are quick and fierce; in Miami, the culture is bright and robust. With turquoise waters and blizzard-white beaches, the city’s natural opulence is found upon its shores. 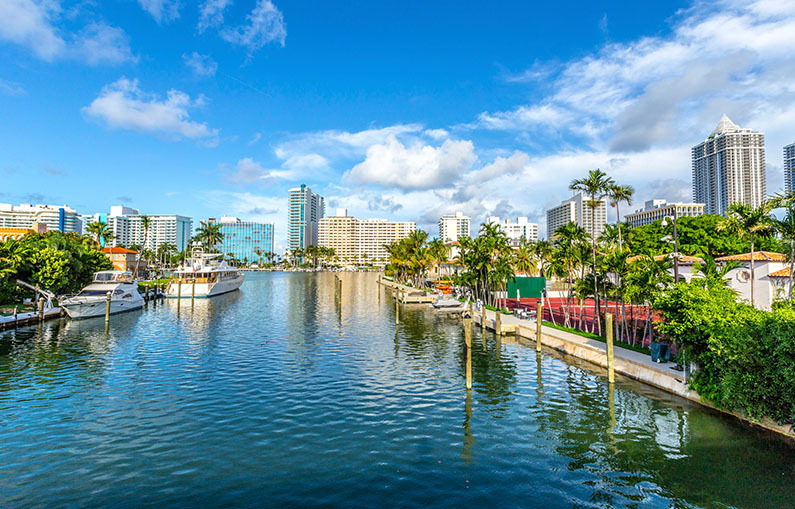 Unwind after a day on the ocean with exciting nightlife and cuisine—Miami moves at a fierce pace, with miles of vibrancies to offer its visitors. Although the famed Versace Mansion is not open to the public (you can stay in one of its suites for a cool $750 per night), a curious traveler can certainly breeze past and revel in the opulence of the estate. The mansion has a Thousand Mosaic Pool, a spa, and a rooftop lounge, though its most impressive feature is undoubtedly its sheer immenseness (over 19,000 square feet). Versace had extravagant taste, and the Mansion is teeming with just that. An eclectic collection of open-air displays, Wynwood Walls exposes a different side of Miamian culture. Over a five-block radius, the art installations serve as an expression of the maddened artistic mind. Using graffiti as their medium, these artists represent an international group, as the project has continued to expand since its creation in 2009. If you’re looking to take a dip (outside the Atlantic Ocean), the Venetian Pool of Miami is the perfect spot. This fantastic facility puts all other public pools to shame: the pool is filled with fresh spring water from an underground aquifer, and the space hosts its own “Mediterranean city” of sorts, complete with a Palm trees, porticos, and a bridge. Relax there all day, if you want to—it’s open Tuesday through Sunday, with nominal admission fees. Beyond the skyline of Miami sits Vicayza Museum and Gardens, the former villa of an impossibly wealthy businessman. Today, the villa is owned and maintained by Miami-Dade county, and is open to the public for exploration. The massive abode has served as the setting for documentaries, the backdrop of multiple big-budget films, and the site of the First Summit of the Americas. To plan your trip to Miami or for an extended guide of things to do, visit the official Miami city guide at http://www.miamiandbeaches.com.